This is the second edition of the powerful peak evolution paradigm shift. It is the means to leave a lifetime legacy more profound, more meaningful, more impactful, and more valuable to world progress than you thought yourself capable of contributing. Peak Evolution offers a breakthrough new approach to achieving the most evolved states known to mankind. It is a means to have right now the advanced functionality of the future human which will not be prevalent for generations. Peak Evolution serves as an explanation and beacon for people who have spontaneously begun to evolve ahead of the general population, and a road map for those who wish to proactively speed evolution. Peak Evolution is a how-to book for achieving beyond your innate potential by harnessing natural evolutionary forces attempting to ensure the survival and peak performance of all living systems. The multitude of systems inside of our bodies or outside of us in a biological ecosystem, for example, are both kept in balance by these natural evolutionary forces. It is therefore only logical to deduce that those same evolutionary forces are also acting upon us directly. Our cultures have simply interfered with our ability to comply with and capitalize on these forces. Peak Evolution identifies ten signals of those powerful evolutionary forces operating in your life so you can harness that flow to function and achieve goals beyond your potential. Your capabilities are extended by the knowledge, intelligence, mechanisms, processes, and creativity of nature. When you align your internal drives with nature’s drives, you cannot help but shift into overdrive. You are perpetually pulled beyond your previous potential into a state of accelerating evolution or ‘peak evolution’. This is how ordinary people have been capable of extraordinary achievements. 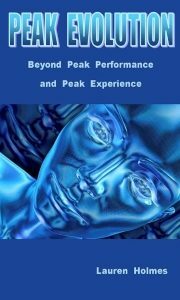 The second edition of Peak Evolution is available on Kindle/digital readers and in a published book. It has only cosmetic changes from the first edition: removal of jargon, corrections, and a new cover.